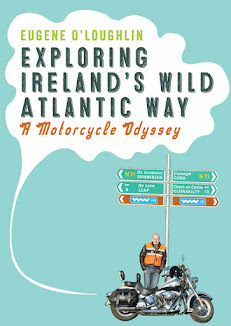 Careful With That Axe, Eugene: New Book Project: "Exploring Northern Ireland’s Causeway and Coastal Routes: A Motorcycle Odyssey"
New Book Project: "Exploring Northern Ireland’s Causeway and Coastal Routes: A Motorcycle Odyssey"
This evening I finally (and modestly!) decided that my trip in the summer around the Northern Ireland coastline should be written up in a new book. Unlike the Exploring Ireland's Wild Atlantic Way book, which was published by the Liffey Press, I am going to self-publish this book through Amazon's CreateSpace as an eBook. It will be possible to buy print copies, but an eBook will be the primary source of delivery. I feel that putting this message on my website will encourage me to get writing - it is now nearly eight weeks since I finished the trip. I think it will be a lot shorter than the WAW book (215 pages) - I'm aiming for about 175 pages with lots of photos, and to have it complete by early next year.